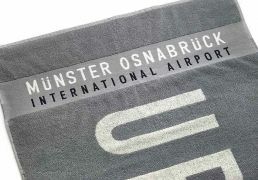 If you want to place your logo well visible as an eye-catcher, we recommend ayard-dyed jacquard weave. Your logo/slogan can be woven in in colouracross the entire cloth. We offer this improvement in fulled, twisted yarn or velour quality. Choose any colour according to the Pantone Formula Guide.